Rabbit, Rabbit, Rabbit friends! I'm thrilled that today is the first day of November. :: Keeping a close eye on a little princess who is feeling under the weather today. 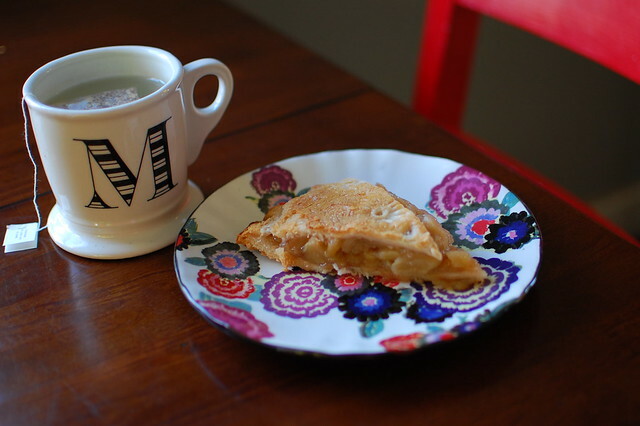 :: Snacking on a piece of my mom's delicious apple pie. The last treat left from my brother's birthday. :: Sipping Egyptian Licorice tea. Mmm. :: hoping that I'll be the winner. :: Wishing my order from Knit Picks would arrive so I can get to knitting. :: Waiting for N8tr0n to get home from Home Depot and fix our water heater. :: Hating that we don't have hot water. :: Looking at the buckets of apples from my mom's tree and wondering when I'll get around to making more apple sauce. :: Admiring my newly organized basement food storage closet. :: Searching for a perfectly amazing patterned arm chair for our living room. :: Pretending we have the money to buy one if I find it. :: Taking a break from fertility medicine and feeling completely relieved as a result. :: Reading Dracula and being totally creeped out when it gets dark. :: Editing pictures from my birthday party. I still need to give you the details and there is no way I'm letting it go undocumented. :: Listening to the new album by Beirut. Holy moly it is good. :: Feeling thankful for my sweet family. Immediate and extended. We are so blessed to have each other. ::Thinking that all of you are pretty fantastic. Thank you for reading, commenting, emailing, and being rad. Oo so much to comment on! Now that I know about Knit Picks I probably won't ever be able to buy yarn from Michael's again. Isn't Dracula super creepy? I love it. We'll have to have a better discussion of this book via email I think. The short of it though? Dracula is awesome. I am relieved for your relief about the meds. Again, this might be better expressed via email. And I think that you're fantastic. Like, really. Still here, still reading, still adoring you. Have a lovely November day! You are so fun to read about! I love Beirut! My boyfriend turned me onto them, and I've been listening ever since. Have you seen this video: http://www.youtube.com/watch?v=FH8vgAp4VDU&feature=related. We like it. Sorry for being an absentee friend/blog follower. I am heartily sorry that I did not read this post earlier (i.e., in time to enter that giveaway!). Seriously awesome giveaway. And since I couldn't enter it, I hope you win! I'm cool like that. I haven't heard of Beirut, but now I will check them out. So glad you have hot water again.